I swear laptops and other electronic devices breed quietly behind our back at our house. With three adult children all studying University degrees plus me and the head of the household, we have a small horde of the things from little things like ipods, phones and e-books to laptops and tablets cluttering up every available surface. Of course, they're all portable devices and they travel regularly, in handbags and backpacks and school bags, on car seats and public transport. They get battered and bashed from pillar to post with all the best intentions in the world. Some of them are even seasoned world travelers. When my University closed down its electronic tablet laptop loan program, as a long term user of a class set of laptops, I got first pick of the best of them as a freebie. I got one with high end specs and Windows 7 however, it came without a case and was a little battered from the whole having been a loan computer process. It works beautifully and lets me annotate my lectures on screen as I am giving them (such a life saver when you teach maths) as well as being portable with a magnificent battery life (at least 6 to 8 hours of continuous use). 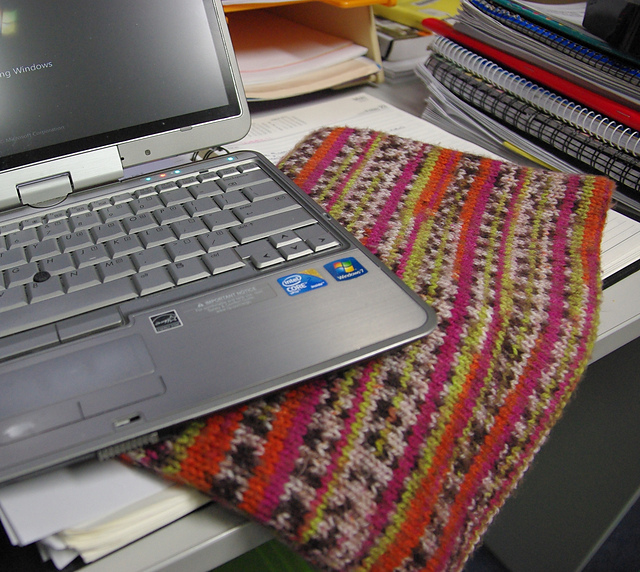 But it needed some protection from being lugged around to class and so as soon as I got it home, I knitted it its own laptop cosy. This is basically a large rectangle folded to give a lining and stitched into an open envelope / sleeve / pocket shape. All the patterning comes from the wool, a cheap pre printed 8 ply acrylic. 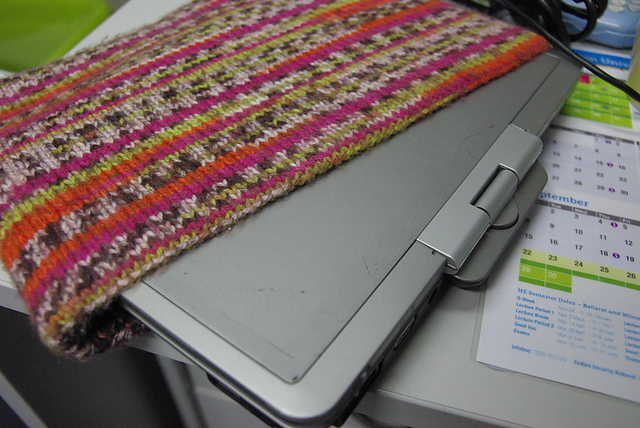 I think it cost me about $6 in yarn to make.It’s wearing beautifully and gets a heap of compliments. It was a really quick knit too. 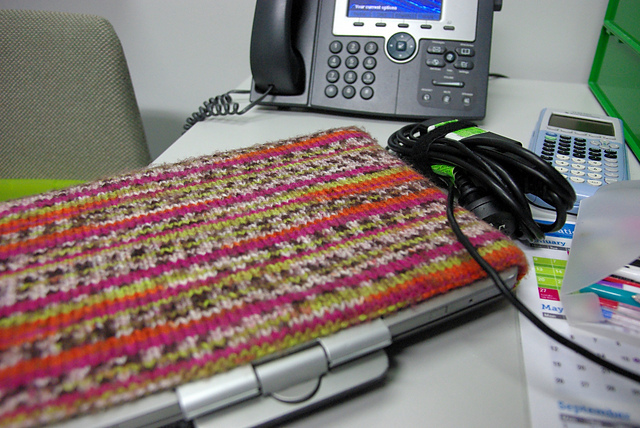 The loudness of the colours makes it easy to spot around the house or in the office. And it makes me happy to look at it! Bee prepared is the final present for Mel and Louise’s giant European Adventure. Mel wanted to take a computer of some sort with her to load photos on and to use free wireless on for Facebook, Skype and email. So she bought a Microsoft Surface, a tablet with a detachable keyboard but running a proper Windows environment. We tried to buy a gorgeous retro cassette printed neoprene sleeve but the Surface is not a standard size. So the cassette tape cover went off to be a Christmas present and I designed a cover to fit this specially. Mel loves bees. (Melissa means Bumble Bee in Greek, See Melissa = Bee). I already had in the stash some gorgeous Cleackheaton Country Naturals in Black and Gold so the colour scheme was under control. I went hunting for free bee charts. 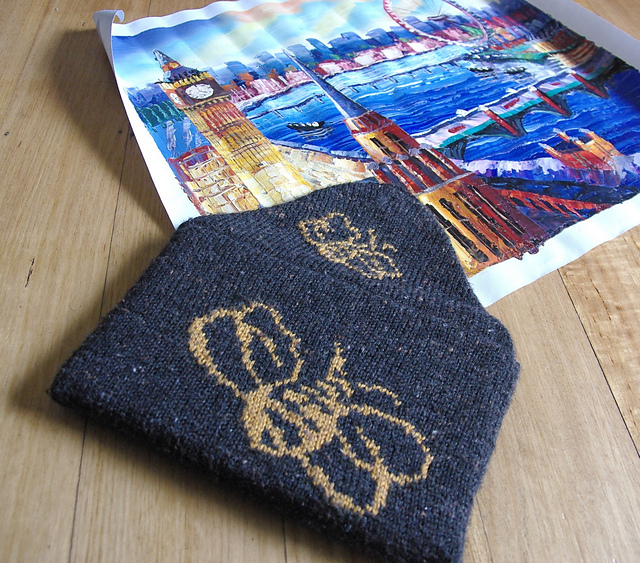 The bee motifs on this are heavily modified from Hummeltuch a double knitting pattern for a triangle scarf / shawlette. The basic construction involves two rectangles and a triangle, mimicking an envelope. 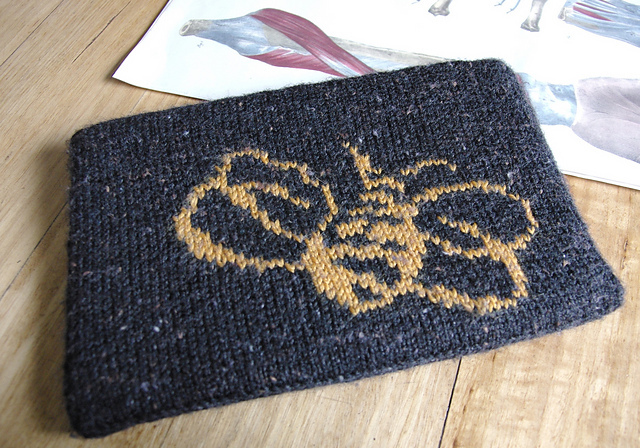 There is a large bee motif asymmetrically placed towards the bottom of the back and a smaller bee on the outside of the flap. 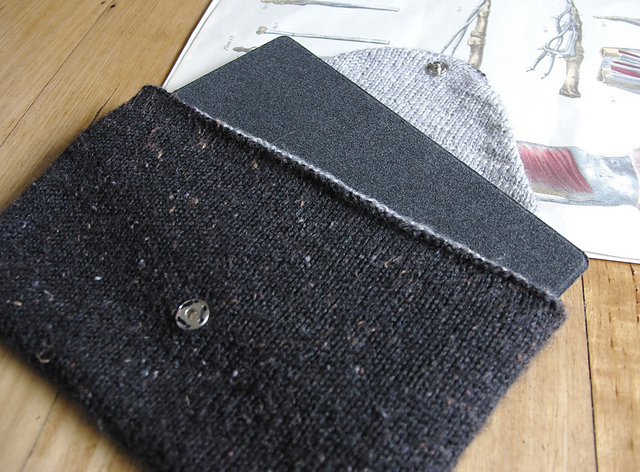 It is fully lined with textured lining in quicksilver grey. The inside has a textured diagonal pattern. 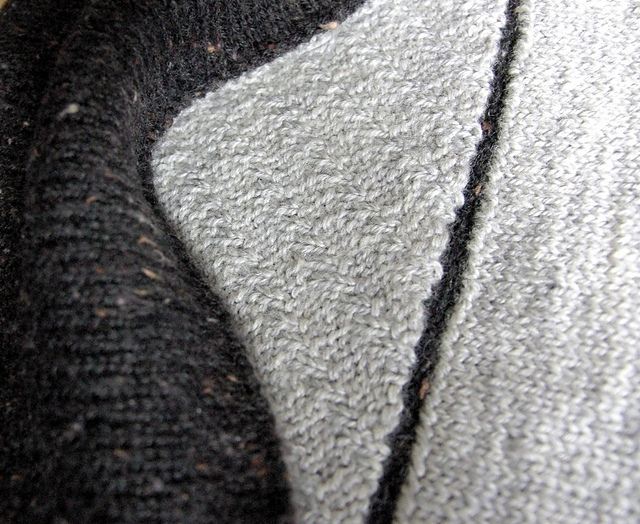 The inside of the triangular flap is lined in stocking stitch. The flap is closed with a single large press stud. This was a finish at the last minute thing. The day before she was due to go, the plain black section still had about 50 rows to go as well as the assembly. So while Mel and I were carefully packing and checking lists, the Head of the Household stepped into the breech and knitted the last of the black section. I sewed it up and and it was ready just in the nick of time. So this was made with love for Mel by both her parents. This case is a well seasoned European traveller. It’s been to London, Paris, Brussels, Amsterdam, Berlin, Prague, Munich, Lucerne, Milan, Padova, Venice and Rome. It neglected to take any selfies though! Mel did take a million photos though and she'll be doing a guest post soon about the giant knitwear tour of Europe. Wonderful knits! I love the bee cover. These are just knit and not fulled? They look so sturdy! I'm glad you love the bee cover. 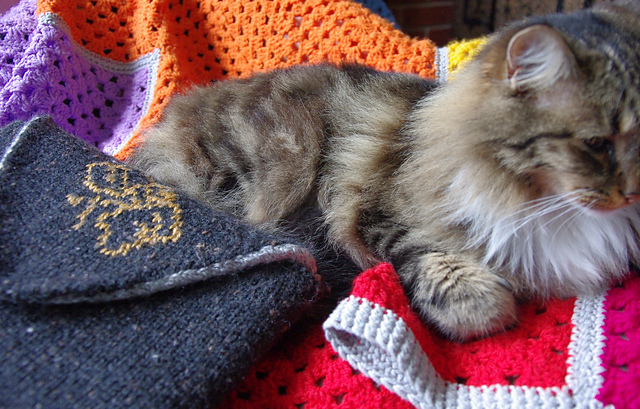 Yes, they are just double layer knitted and not fulled or felted at all.